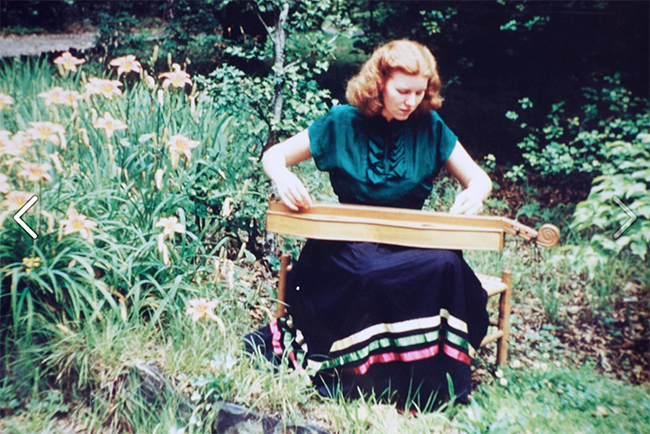 Jean Ritchie at the Folk School playing the mountain dulcimer during the summer of 1948. 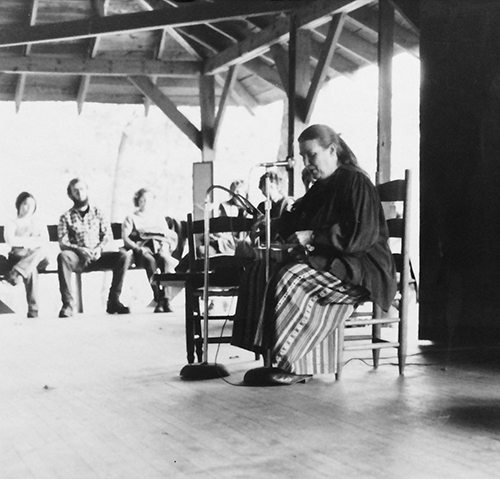 Jean Ritchie (February 1922-June 1, 2015) was an icon of Appalachian folk music. The youngest of fourteen children, Jean grew up in Viper, Kentucky hearing songs throughout the day as her parents and siblings sang while working with crops, cleaning the house, walking to places in the community and while at leisure. Jean was the only Ritchie to not attend the Hindman Settlement School in Kentucky; she attended and graduated from Viper, Kentucky high school. Jean Ritchie plays a concert in Open House in 1979. 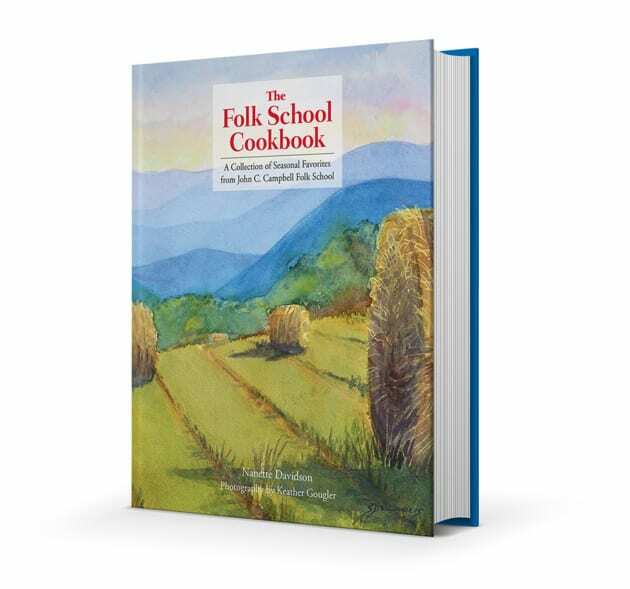 By the time Jean left home, she knew over three-hundred old mountain ballads and folksongs. Perhaps her biggest legacy is the fact that when she moved to New York city to teach music in a settlement school, Jean brought a dulcimer with her. Because New York was a hub for the folksong revival, Jean introduced the dulcimer to a community of folk music lovers in New York, and through her appearances at folk festivals, colleges, and universities she created a national interest in the dulcimer in the United States, as well as Great Britain. In the 1940s Jean married photographer and filmmaker George Pickow. 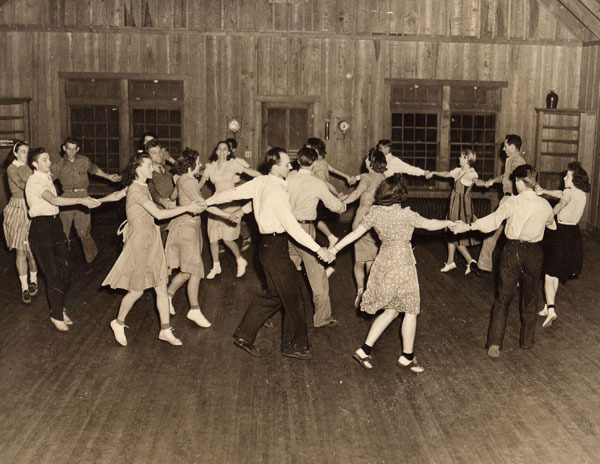 Jean’s husband accompanied Ritchie on an 18-month trip to Great Britain, where Jean collected folksongs and studied the relationship between the ballads in Great Britain, and the ways that the lyrics changed after they had reached Appalachia. 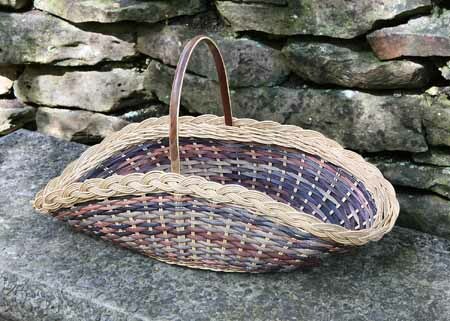 In 1917, Jean’s elder sisters, Una and May, sang for British folksong and ballad collector Cecil Sharp. It was May Ritchie who married Leon Deschamps; Deschamps came to work at the John C. Campbell Folk School, and among other things built studios and homes out of field stone. May lived at the Folk School with her husband, and Jean would come and spend summers here prior to Jean’s marriage to George Pickow. The lovely photograph (above) of Jean playing the dulcimer was taken while Jean was here at the Folk School during the Summer of 1948. Jean was twenty-six at the time the photograph was captured. In this photograph, Jean is playing a dulcimer built by Nathan Hicks of Northwestern North Carolina. This dulcimer is still in the collection of the Folk School and is on exhibit in the History Center. Because of their singing, concerts, and presence in Brasstown, Jean and her sister, May Deschamps, will long be remembered here at the Folk School. 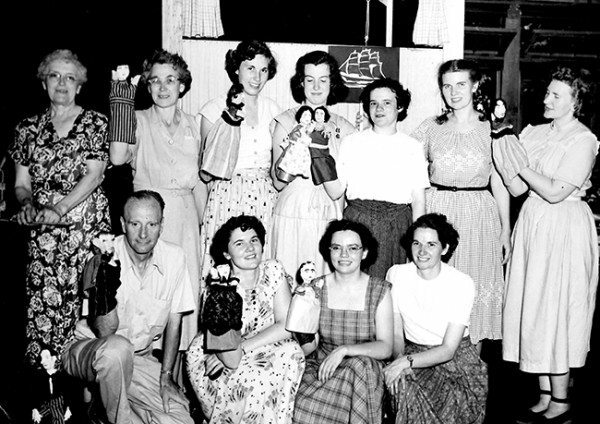 A Folk School puppetry class of the early 50s has their “show and tell” in the Community Room. Among the puppeteers are Jean Ritchie (in gingham dress, back row, 2nd from right) and her sister (far right) Edna Ritchie Baker. 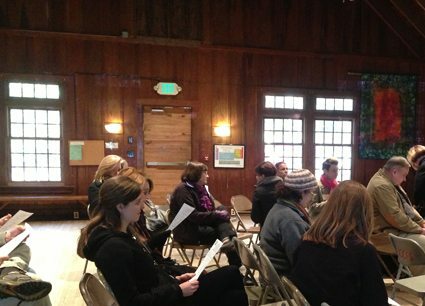 Thanks so much for the blog about Miss Jean Ritchie. Without a doubt she made the lap dulcimore and the old ballads available for many to learn, and so many did including yours truly.